Sooner or later, almost every child gets carried away by strong emotions. For some children, it’s an everyday occurrence. We parents can get carried away ourselves, especially when we have one or more children whose feelings erupt often, and don’t soothe easily. Here are five ways to help kids who hit, kick, or bite. Why do children become prone to hitting, kicking, or biting? In my 40 years of experience, there’s always a reason, and a good one, but those reasons are often hidden deep in a child’s early experience. If a child has been in danger in some way—at death’s door due to premature birth or some medical crisis, the victim of a frightening accident, or unable to warmly connect with their mom or dad because of hard times in their family—he or she is trying to manage feelings of terror. That deep fear arose in response to real threat. Your child was small and helpless. Circumstances went out of control. They had no power. They didn’t know if they would survive. Now that they’re 18 months old, 2 years old, or 5 years old, and life is humming along, they do fine until some small incident reminds them of those overwhelming feelings. All it takes is a child stepping on their toe, Mommy leaving to go to work, or a food appearing on their plate that they don’t like. Feelings rooted in the past rush in and temporarily hijack their ability to reason. They feel threatened and determined to fight for themselves, now that they’re on their feet and have some power. Your fighting, biting, kicking child is not bad. They are not immature. They don’t really want to hurt anyone. But overwhelmed with that blinding feeling of threat, their behavior goes wild. They’re looking for a way to do all they can to “save” themselves. They’re caught in an outdated drama, and what’s healing for them is to be guided through it without harming anyone. If they can vent these feelings with a parent’s support and caring, they will come through the other side feeling more whole, more competent, more worthy of respect. Children who never get to fight for themselves after a terrible experience are children who will either be overly aggressive with others, or overly retiring and unable to stand up for themselves when they’re tested. The fear stays stuck inside them. It’s as if an old thorn is still poking their flesh, making life more painful, and robbing them of grace and ease in their relationships. Here’s what you can do to help your hitting, biting, kicking child. These initiatives keep you from frightening your child further. They keep you and your child safe. And they help heal that deep fear once and for all. If you listen and guide him through, your child can begin to relax more, laugh more, and feel more connected to you and the others they love. Your child feels alone and threatened. If you listen and offer your caring, then good, calm, confident signals go into a brain that’s on fire with fear. Slowly, slowly, the fire of fear will be doused by your calm and caring. “I won’t let you hurt Joey.” “I’m right here with you.” “No one is mad at you. We want the best for you, sweetheart.” “I won’t go away.” “Whatever frightened you is over. It won’t happen again.” These are the things you can say to a wildly irrational child. He won’t respond well at first, but these messages seep into his system, and slowly but surely, his mind will unload its prickly, “I will fight until I die” reaction. The sweating and screaming and trembling are signs that something deep and awful is actually healing, thanks to the safety you offer. Listen. It’s powerful. Your child will feel much better afterward. Sometimes, a kicking, biting, hitting child is helped by small but powerful gestures of caring. If your child is screaming in a corner of his room, saying, “Go away! Go away! I hate you!” you can hold one hand out toward him. This gives him a safe target to hit without hurting you. Oh, you’ll feel it, but a child can’t do real damage that way. So allow him to show you how awful it feels. Let him know that you won’t stop loving him. “You can tell me to go away, but I will still want to be with you.” “I’m not going to leave you while you feel so awful.” “I see how hard this is for you,” are ways to show that, whatever emotional hurricane is blowing through his system, you know he’s in there, and he is still yours, still the apple of your eye. Give him time to work the feelings out of his system. Emotions are a vital part of our existence. They are part of a fine-tuned system for clearing our minds and hearts of negative gunk left over from hurtful or frightening experiences. Your child eats a banana—a perfect fruit—and yet his digestive system can’t make use of the whole banana. There’s stuff left over that has to be ejected. Your child has an intricate system for taking care of the leftovers. He pees, he poops, and we make allowances for that. Crying, tantrums, and laughter are the emotional clearing system for feelings that come along with challenging moments. Once your child expresses these feelings with your support, he’ll return to his affectionate, creative, good-natured self. It’s an amazing transformation. Your support and caring helps turn the worst moments into a closer, warmer relationship. Parenting is emotional work. You deserve emotional support. We all need someone to cry with about those moments when we feel angry, confused, alone, sad, frustrated, or ready to walk out the door we’re so steamed. 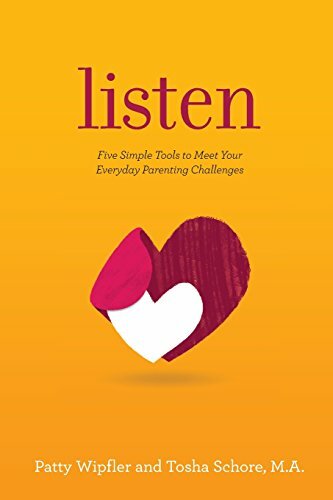 I highly recommend finding a Listening Partner, and exchanging 15 minutes to half an hour of listening time each way, so each parent has a chance to think and notice all the feelings that crop up each day. Take some time to laugh, cry, and vent with another grownup. It’s refreshing! It helps your perspective. And perhaps best, it helps you feel less alone on your own path, because the other parent tells you their unvarnished saga, too. Parenting is a challenging job. So get some listening time to “tank up” on positive regard and human warmth, especially for you. Your hitting, kicking, biting child will find his or her way toward inner peace if you listen. And you can find your way there, when you trade listening with another caring parent. Here are more Tips for Squashing Tantrums!